"Is A New RV Right For You? Here Is The Information You Need To Decide"
Depending on the type of RV you are considering, this could be one of the most important and expensive purchases you will ever make in your life. So it is very important that you research your choice thoroughly. We will do everything we can to help you with this research. Buying a RV is not like buying a car, unless the car you are looking at has a a stove, sink, refrigerator and king size bed in it. 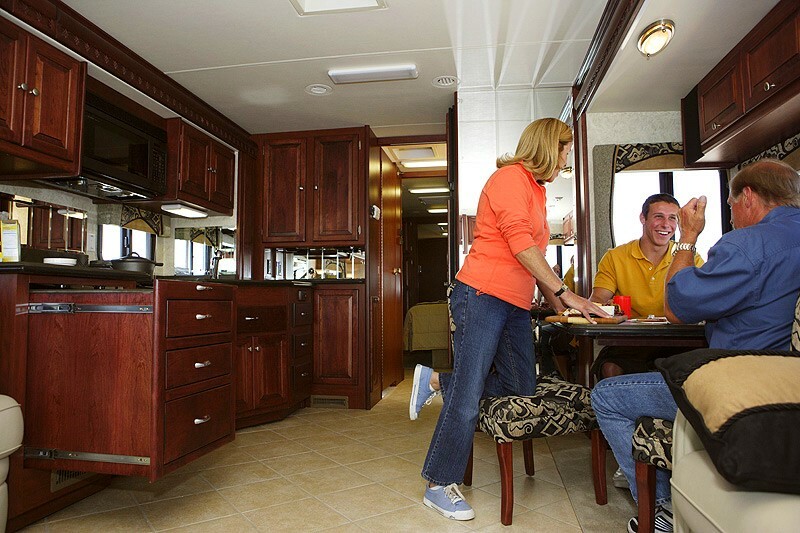 Hopefully, you will be spending a lot of leisure time in your RV so you want it to be the right fit for you. There is one important exception and that is location. The location is wherever you want it to be. Your RV can be in the mountains one day and on the beach the next (try doing that with a vacation home). So, in reality your RV is going to be your vacation home on wheels. Will have separate manufacturer warranties on appliances, chassis (Class A and C Motorhomes). The house part of the motorhome is warranted by the RV Manufacturer. You will have a better choice of floor-plans and interior colors etc. when buying new. Loan interest rates are usually lower when financing a new Recreation Vehicle (depends on your credit history). You will get the most up to date RV technology. Will not have to worry whether the RV was well maintained before you bought it. Will have that new vehicle smell (you can buy a can of spray scent that gives you the same smell, just a thought). Will depreciate immediately once driven off of the RV dealers lot. License and registration fees are higher on new Recreation Vehicles. Depending on type of RV, you will probably have to finance the purchase (unless you are independently wealthy). Because an RV is a house on wheels, there will be warranty items that will have to be repaired during the first year of ownership (it will have some shop time). Hopefully, the above information will be helpful in steering you in the right direction. If you have decided that a new RV is the right type of RV for you, you should now head over to the Buying a RV section of this web site to get some more helpful hints. One thing is for sure you will never regret becoming an RVer regardless of the type of engine you choose.